Major automotive suppliers see national [U.S.] fuel economy standards as important for long-term planning and investment and don’t want to see them altered by policymakers, according to a first-of-its-kind industry survey commissioned by CALSTART, an automotive technology industry group. CALSTART commissioned Ricardo Energy & Environment - a global environmental consultancy that specialises in the development and implementation of sustainable policy and technology across the automotive industry - to conduct the survey over the summer. 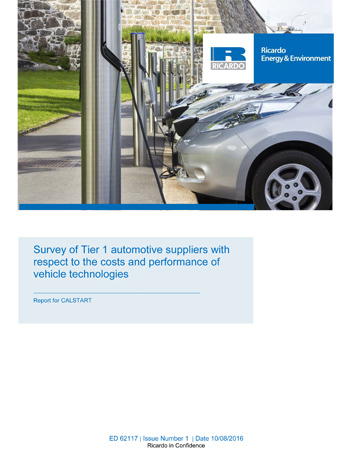 The firm polled and interviewed 23 suppliers, almost all of them global Tier 1 suppliers that sell parts directly to automakers. 70 percent of suppliers said policymakers should not adjust the program’s goals. 65 percent agreed with the decision to set new miles-per-gallon standards for 2025, with 30 percent saying they strongly agreed with the decision. Among those who agreed, all but one named regulatory certainty as critical for the industry and half said the standards spark innovation. 59 percent said that fuel-economy standards help spur job growth. Suppliers identified a wide range of conventional and electric technology that could be used to meet the standards. Three quarters agreed that setting targets beyond 2025 is also important for long-term planning. Mihai Dorobantu, the director of technology planning and government affairs at Eaton Vehicle Group, a major automotive supplier that participated in the survey, said he appreciated CALSTART seeking insights from advanced technology suppliers. When presented with a list of technologies that might be used to meet fuel-efficiency standards, suppliers picked turbocharging and engine downsizing, along with higher-speed automatic transmissions, as the most critical. Hybrid technology was also viewed as important, along with variable valve timing, gasoline direct injection, and mass reduction. Suppliers were split on whether or not meeting the standards would ultimately require more electric vehicles than are already slated to hit the roads under state zero-emissions vehicle requirements. Earlier this summer, the Environmental Protection Agency (EPA), Department of Transportation (DOT) and California Air Resources Board issued a technical analysis of Corporate Average Fuel Economy (CAFE) and greenhouse gas standards for light-duty cars and trucks, focusing on mileage requirements for model years 2022 to 2025. The agencies will take public comments on the analysis until September 26, and will formally propose new requirements next year. Starting in 2008, agencies reformed fuel-economy requirements to make them footprint- based, meaning smaller vehicles have higher miles-per-gallon requirements while larger vehicles have lower ones. Suppliers emphasized that even as all vehicle types become more efficient, consumers are expected to buy more large cars, trucks and SUVs if gas prices remain low. Overall, federal agencies project a fleet-wide fuel economy average of between 50 and 52.6 miles per gallon under test conditions for the 2025 model year. That translates to an average of 36 miles per gallon in actual on-road performance, which is about what today’s gasoline-powered Honda Fit already achieves. The full survey is available online, and CALSTART is posting findings and graphics based on the results on Twitter (@Calstart). For a full copy of this press release click here to visit the CALSTART web site where download links are available both for the full report and executive summary.